There are wide spread up bars, very wide spread up bars and then there’s yesterday’s which quite frankly is hard to describe and to be honest I have run out of adjectives to describe a 500 pip move on the day. I really hope you followed my advice to you yesterday which was to go long but to be perfectly honest the extent of the move was completely unexpected. Under normal circumstances I would have no hesitation in suggesting that you buy into the market again today as from a technical perspective there is only one way to trade. However, these are far from normal market conditions and whilst such a breakout would suggest further moves higher one does have to temper this against the current fundamental picture and an interesting quote from an analyst at UBS suggests that this negative effect on the dollar would dissipate as the US is not targeting the money supply, like the Bank of England decided to do. From this morning price action the follow through has been muted and therefore I would advise caution in your trading today. If you are inclined to trade long then buy on dips in the hourly and only look for small profits. 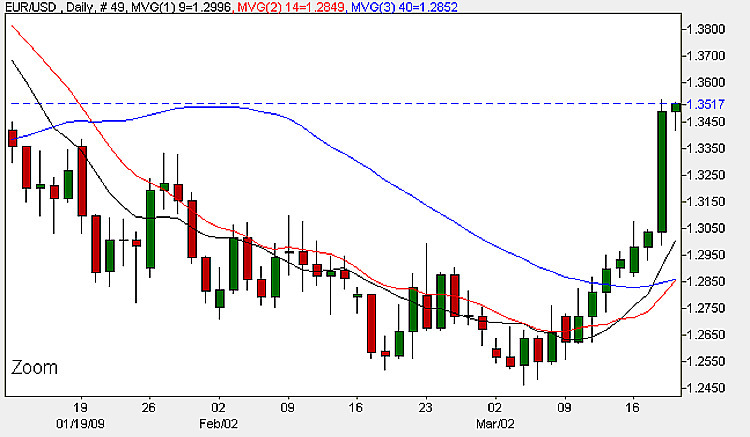 Alternatively wait for a short term reversal signal in the daily chart to confirm a move lower in the medium term. For the latest currency news, fundamental news and the economic calendar for today, live currency prices or for help in finding an ECN broker, just follow the links here.